Beth Hamilton exhib. 1906 – 1916, Ealing,London. landscape painter. 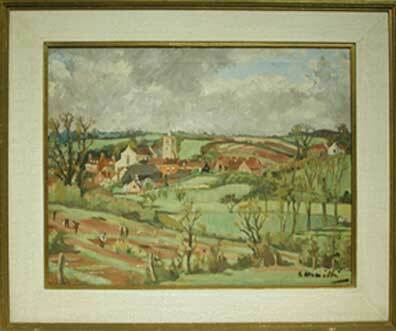 Depicts a view of the village of Standon which is located on the A120 near Bishops Stortford, Hertfordshire. On the verso of the painting an inscription states that Stanton is “1 mile from Latchford in the county of Hertsfordshire” the latter must be very tiny as it is not visible on any map we have consulted.. figures can be seen working in the allotments n the foreground with a fine village Norman church in the middle ground. Oils on Canvas. Signed (Bottom Right). Glazed, Period liner and giltwood frame.